A comment was made recently about the Third Order of Mercy. In many respects, this is a widely unknown aspect of the Mercedarian Friars. Perhaps, this is true for other Religious Orders and Congregations who have some sort of lay involvement. From the very foundation of the Order, lay people have played and taken an integral part in the Redemptive Mission of the Friars. Recall, that the Order was founded by a layman -- S. Peter Nolasco. The Order was a "Brothers' Community (i.e. non-clerical) from the very beginning. 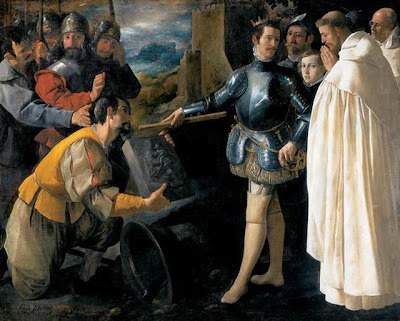 In the course of time, the Order's structure would change, yet the same involvement and necessity of the collaboration of men and women in the apostolic works of the Friars would remain the constant. “Since the beginning of the Order, lay people have participated and collaborated in the exercise of our redemptive mission, forming various associations and confraternities. 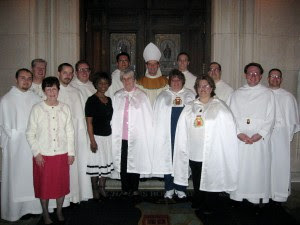 Among the most important is the Third Order, an association of lay people integrated into the Mercedarian family, which participates in the redemptive spirit.” (Constitutions of the Order of the B.V.M. of Mercy, #117). 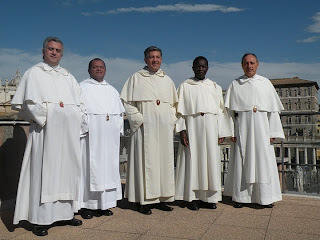 Members of the Third Order know and cherish the spiritual treasure of the Order so they are able to realize the Mercedarian ideal, according to the directives of the Church and of the Order, in keeping with the circumstances of each country. 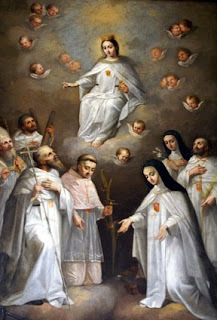 Candidates for the Mercedarian Third Order receive the scapular of the Order during the initial stages. 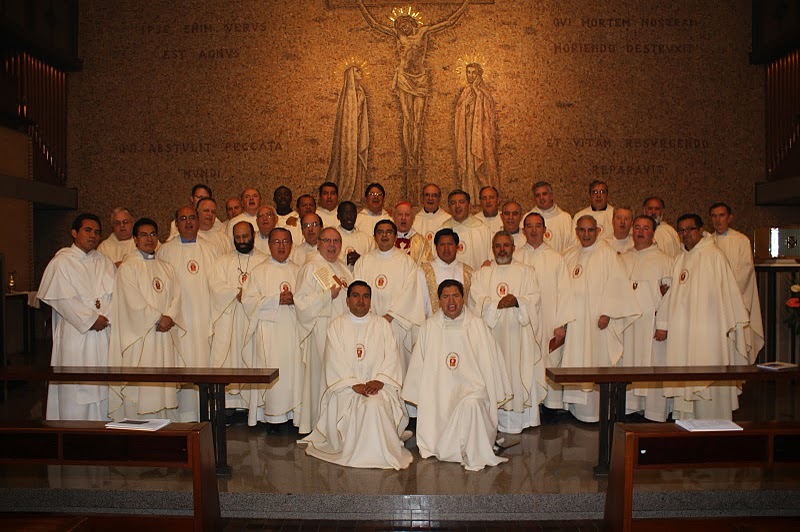 After a period of preparation-study of the history, spirituality, and charism of the Order-the candidates who have already received the scapular request their incorporation into the Third Order with full rights and receive the shield of the Order. Many spiritual privileges have been granted by the popes to the Mercedarian Third Order members. Upon fulfilling the usual conditions of reception of the Sacraments of Penance and Holy Eucharist and prayer for the Holy Father, they can gain a plenary indulgence on the day of their admission and on the liturgical feasts of the Order. 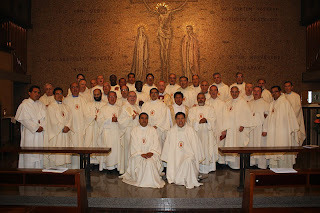 They also share in the merits of the prayers and good works of all the members of the Mercedarian Order. They share in the special suffrages many times throughout the year on the constitutional commemorations and on November 7th in remembrance of all the deceased religious, Third Order members, and benefactors of the Order. 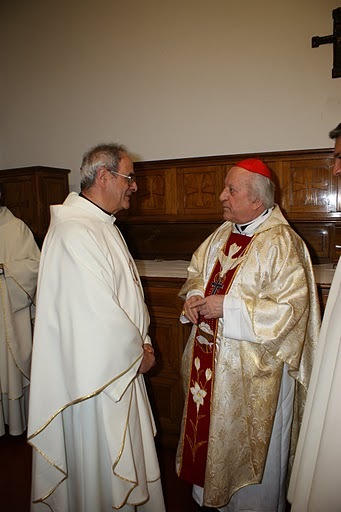 The Capitular Fathers of the XV General Chapter of the Order of the Blessed Virgin Mary of Mercy have elected the The Most Revered Father Pablo Bernardo Ordone, O. de M., as the 88th Master General of the Order. He is the legitimate successor of our Father and Founder, St. Peter Nolasco. This is an immense moment of grace for the entire Order, throughout the world. A new chapter, a new moment of renewal and grace is possible and open to us. The Holy Spirit, at work through salvation history, is also at work in the spirit and charism of the Order. Let us pray for Fr. 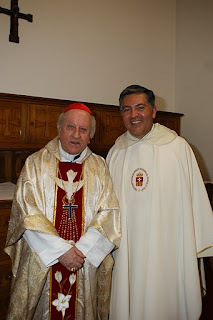 General and the entire General Curia. We humbly submit and obediently place ourselves in service to the work of Mercy and the Redemptive Mission of the Order, under the guidance and direction of Fr. General. God, the Father of mercy and God of all consolation and giver of comfort in all tribulation, by His great mercy sent Jesus Christ, His Son into the world to visit the whole human race which was on earth as in a prison, captive, in the power of hell and the devil, and to visit and free all those friends who were in that prison in the power of the enemy, and to bring them to His glory: not only these but also all others, who by grace will occupy the places of the angels who for their pride fell from heaven and became demons; so, the Father, the Son, and the Holy Spirit, in Whose works there is no distinction, with great mercy and compassion decided to found and establish this Order called the "Order of the Virgin Mary of Mercy of the Redemption of Captives, of Saint Eulalia of Barcelona"; they named Brother Peter Nolasco servant, messenger, founder and leader of this work. The power and intention of Brother Peter Nolasco and of all the other Masters General who have succeeded him, along with the effort and the work of the brothers of the entire Order have always been directed to this: that the Master general and the professed religious of this Order, with faith in Jesus Christ, with hope of salvation and true love of Him, Who, by taking flesh from the holy and glorious Virgin Mary, true God and true man in one person, and by suffering His Passion and Death for us, visited us -- in face he is always visiting His friends -- and freed those who were in the power of hell, the religious may work wholeheartedly and willingly and by every good work in visiting and freeing those Christians who are in captivity and in the power of the Saracens and other enemies of our Law, according to the good disposition and will of the Master of this Order. 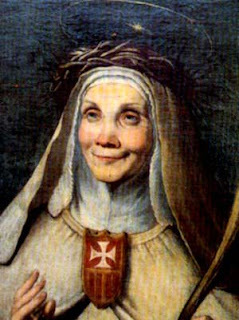 To continue and to hasten this work of mercy, namely to visit and to free those Christians from the power of the enemies of the commandment of Jesus Christ, all the brothers of this Order, as sons of true obedience, must always be gladly disposed to give up their lives, if it is necessary, as Jesus Christ gave up His for us so that on the Day of Judgement, placed at the right on account of His mercy, they may be worthy to hear from the mouth of Jesus Christ those sweet words: "Come, blessed of my Father, receive the kingdom which has been prepared for you from the foundation of the world, for I was in prison and you came to visit me. I was sick and you comforted me, I was hungry and you gave me food, I was thirsty and you gave me drink, I was a stranger and you took me in". Jesus Christ ordered that all these things be fulfilled in this Order to maintain and foster a work of so great a mercy as it is to visit and to redeem Christians in the power of the Sacracens and others who oppose our Law, since this is the very reason why God has established this Order. -- Proemium of the 1272 Constitutions. This is still, nearly 800 years later, still a part of our Constitutions. Happy Feast to Day to all the Friars in the Order, and to those faithful and priests who have a special devotion and affection to St. Peter Nolasco and our Blessed Mother of Mercy. 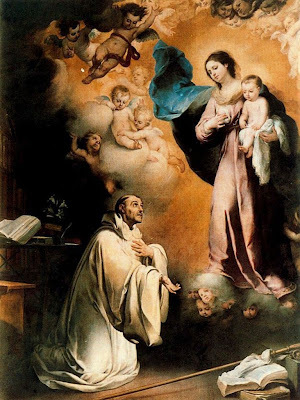 A merchant and a gentle man, St. Peter Nolasco was holy in a radical sense. With a small group of friends and fellow workers with whom he had been associated for some time, he founded the Order of the B.V.M. of Mercy for the Redemption of Captives in 1218. Because of his liberating activity, he was and remains within the church and for the world, the living image of Jesus surrendering himself to the point of death to save and redeem captives, sinners and the lost of this earth. Being a merchant, a bourgeois born around 1180, he begins to work hard at the beginning of the 13th century. Differently from Francis of Assisi, Peter does not feel the need to break with all forms of money, wealth and buying and selling in order to reach Christ’s radical poverty. He comes to the same conclusion but in a radically different way: he encounters Jesus in the very heart of his business, he meets him in the captives, in the Christian slaves in Moslem lands. This leads him to the center of the social and religious conflict dividing the known world at the time.